After apprehending Harrison Wells in last week’s “Rogue Air,” I was immensely curious to see where Andrew Kreisberg and Greg Berlanti would take us for The Flash finale. I had expected the final showdown between Barry and Harrison to come in the finale, perhaps once again in the past as Barry attempted to save his mother. Instead, by moving up the big fight a week, the show chose to slow down and focus on the latter event, the death of Nora Allen. In its most important episode to date, The Flash, as it has for much of its inaugural season, impressed. I had trepidations heading into “Fast Enough,” despite the hot streak leading up to the finale. Those concerns derived primarily from “The Man in the Yellow Suit,” which served as the fall capper and decidedly dropped the ball. That episode was over-packed and overwrought—an hour that attempted to give light to three major story advancements, all of which were extremely emotional for feature characters, and instead of giving them their due, shrouded them. “Fast Enough” did not suffer a similar fate as it zeroed in on one massive decision and, save for the occasional scene, did not diverge. That decision, of course, was whether Barry should travel back in time and save his mother. Clearly not a light matter, given the fact that Barry could potentially alter his life and the lives of others in irreparable ways (and, as comic readers know, the decision to save Nora in Flashpoint does not go particularly well), the final hour gave that decision real time to breathe. Barry contemplated for nearly half the episode, consulting all those around him on what he should do. As was discussed last week, The Flash is a different kind of hero. He is not one to bark orders and manipulate the morale of a situation for the greater good. He considers all aspects, and all people, that his choices effect and this choice was no different. Barry spent time with nearly every member of Team Flash and others, all in an attempt to figure out what the right decision was. This led to a bevy of emotionally taxing, but rewarding scenes, particularly those with Barry’s fathers. One of my favorite aspects of this first season has been the relationship Barry has with the two men most important in his life, his biological father, Henry Allen, and his adopted dad, Joe West. There has been, for the most part, a lack of pettiness with these two father figures, in favor of an approach where our hero can have two fathers and love both equally for differing reasons. It also helped that both John Wesley Shipp and Jesse L. Martin have excelled in their respective fatherly scenes, making them some of the most poignant of the series. Last night was no different. Though he’s only appeared a handful of times, the moments Barry has shared with Henry have been powerful. In “Fast Enough,” it was Henry, as he often has, who was the sobering voice. After Joe had, surprisingly, told Barry to risk it and save his mother, Henry warned him against taking such a huge chance. He reminded him of the life he was gifted after his mother’s death, of the time he got to spend with Joe, and Iris, and how all that could be lost if he gave in to his pain and chose to be selfish. But, Henry proved to be a dinghy in the face of a tidal wave, as both Joe and Iris (the people whom Barry is most likely to listen to) told him, in direct and indirect terms, to go for it. But we’ll get to that in a minute. What I particularly loved about “Fast Enough,” enabled by its commitment to giving the episode’s central decision a legitimate amount of time to develop, was how it allowed all of its major characters to have a moment of their own. What “The Man in the Yellow Suit” set out to do and failed, “Fast Enough” set out to do and succeeded. 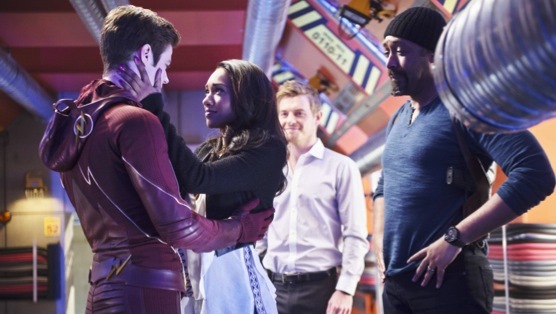 As I mentioned, Henry Allen had a beautiful scene, Barry and Joe had multiple scenes that were in line with many of their best this year, Caitlin and Ronnie were married, Cisco discovered a life-altering fact (he’s a metahuman), Iris and Barry had one final meeting on the roof, Eddie had three of the best scenes in the entire episode (the first, in which Martin Stein told Eddie that he was the most intriguing man in a room full of heroes because he was something scientist’s can’t account for, an anomaly, and a controller of his destiny, was a particular favorite). No one was left to the side, but the hour also didn’t try to do too much with all of its characters. It knew what the heart of the episode was and it didn’t try to squeeze anything else in, instead found smaller (but no less effective) ways to give every performer one final moment in the spotlight. So, let’s get down to the meat of it. As I mentioned above, the pervading choice was for Barry to save his mother. And, as the show has done all year, once Barry made his decision, those close to him stood by him and helped in any way they could. In order to do that, The Flash had to run at an absurd speed (Mach 2, if you’re counting at home), and collide with a Hydrogen particle to create a wormhole. He would then have less than two minutes to save his mother and return back through the wormhole, or else he could create a singularity (black hole) that would not only envelope Central City, but likely the world. Naturally, Barry couldn’t achieve this alone, and he couldn’t achieve it solely with the help of Team Flash. Enter Harrison Wells. Not one to sit on the sidelines, Harrison quickly offered Barry a deal: he would help the Scarlet Speedster save his mother if he was allowed to return to his time. Once the plan was put into motion, little was wasted. Barry quickly ran up to speed, was able to create the wormhole and use the Speed Force to navigate his way to the night his mother was murdered. Once there, though, it became clear that Barry’s choice wasn’t made at all. In fact, it was future Barry, who upon seeing his younger self, waved him off and told him not to save his mother. The show did give Barry the closure he desperately longed for, however and the scene between Barry and his mother, as so many were last night, was devastating, but superbly written and performed. With the hope of saving his mother gone, Barry returned to his time to face Harrison. This was where we got our only real fireworks of the evening, as Barry destroyed Harrison’s time machine and closed the wormhole, stranding Reverse-Flash once again and leaving nothing left to do but fight. As they have been for much of the previous 22 episodes, the fight sequence in “Fast Enough” was fun and satisfying. But, as they haven’t for much of the first season, the final showdown last night came with a serious consequence. As our hero looked to be outdone by his reverse, it’s Eddie who saves the day. Realizing that, as a distant ancestor of Harrison (who is, of course, really Eobard Thawne), if he ceases to exist so will Harrison, Eddie shoots himself in the chest. In his final moments, with Iris by his side, Eddie says that all he wanted was to be her hero. In the end, he was not only hers, but everyone’s. Eddie was the easiest choice for a character death, but it was not without merit. The Flash writers did a nice job of developing Eddie this season as a minor character, making the audience care for him at times, loathe him at others, but never forget him. By the finale, it was clear that Eddie was a distant relative of Eobard’s in more ways than one, and after the wrenching speech Harrison/Eobard gave him a few weeks ago, about how he was the only Thawne history would forget, it was fitting to see Eddie stick it to him. And though it wasn’t the most shocking exit, Eddie’s absence will undoubtedly bring ramifications for Barry, Iris and the entirety of Team Flash next season, and that will be interesting to watch. Though they were able to close the wormhole initially, the death of Eddie and the erasing of Eobard from history caused another, much stronger, wormhole to open that quickly turned into a singularity. Hanging above Central City as the most ominous cloud imaginable, the black hole quickly began to grow as the inhabitants of the city could only watch. All except one, of course. And he began to run. The Flash stormed out of the gates last fall, and it finished the exact same way. The last stretch of episodes was phenomenal and “Fast Enough” was the exclamation point on a superb first season. Fans couldn’t have asked for much more than what Kreisberg and Berlanti gave us in this first effort. From the beginning, The Flash was a decidedly different, but connected, show to Arrow, one with a lighter touch and a lot more room for fun. Throughout the year it gave us thrills, mind-bending stories, and more than a pinch of heart. At the end, after an hour full of pain and heartache, as Barry raced toward the black hole, hoping he could run fast enough to diffuse it, the show, as it did in week one, left us with one sense more than any other: wonder.